Registration for the SOT Annual Meeting and ToxExpo includes admission to all Scientific Sessions, ToxExpo, the Welcome Reception, the Awards Ceremony, a downloadable PDF of the Program, and a downloadable PDF of The Toxicologist (abstracts). Continuing Education courses and select other events are available as add-ons to your meeting registration. See pricing outline below. For your convenience, you can register for Continuing Education (CE) courses at the same time as registering for the Annual Meeting and ToxExpo. If you have already registered for meeting, use the Mail or Fax Registration Form to register for Continuing Education courses. 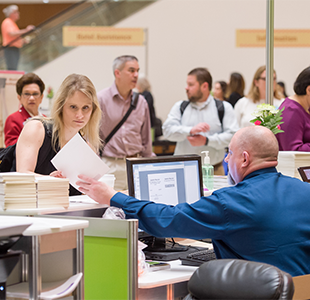 For your convenience, you can register for optional events at the same time as registering for the Annual Meeting and ToxExpo. If you have already registered for meeting, use the Mail or Fax Registration Form to register for one of the items below. * After February 7, final registration rates apply. No substitutions after January 11, 2019. SOT will accept faxed Registration Forms until March 7. Online registration will be open throughout the Annual Meeting until March 14. On-Site Registration Forms will be available at the Annual Meeting Registration Desk. ** Not an SOT member? Apply for SOT membership by the December 31, 2018, application deadline to enjoy discounted member registration rates. Those who are accepted are notified in late February when the Membership Committee has finalized their review. You have the option to register for the Annual Meeting now at the nonmember rate or wait until the week of February 7 to register at the Final Registration member rate for substantial savings if approved as an SOT member. If you miss the December 31, 2018, deadline, nonmember 2019 Annual Meeting attendees can submit applications for the March review cycle (deadline March 31, 2019), and upon acceptance, SOT will waive your 2019 membership dues! + Guests and spouses must be registered for the Annual Meeting to access the Hospitality Room. Guests should register with the person they are accompanying. If the person they are accompanying is already registered, they must use the Guest Registration Form and email, mail, or fax it to SOT Headquarters along with a copy of the registration confirmation of the person they are accompanying. Guests are welcome to attend the Welcome Reception, but will not have access to the Scientific Sessions or ToxExpo. Reminder: Guest/spouse registrants and children under the age of 15 are not permitted in the ToxExpo at any time or in Scientific Sessions unless the session chair has provided consent for the guest/spouse or child to attend. Exhibitors should register using the Exhibitor Service Center. If your organization would like information on exhibit opportunities, visit ToxExpo.com or contact Will Low (703.438.3115).